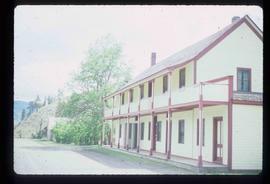 File contains slides depicting buildings and places in and around Ashcroft, Kamloops, and Hat Creek, B.C. 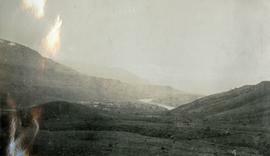 Photograph depicts rolling hills with dry vegetation and river in the background. 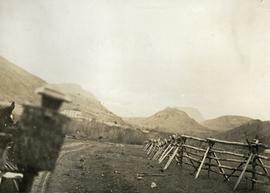 Photograph depicts a view possibly from a stage coach, fences and rolling hills with dry vegetation in the background. 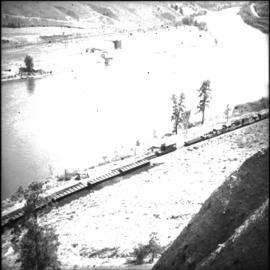 Photograph depicts a derailment of a coal unit train between Basque and Martel, at about mile 63 which is approximately 15 minutes south of Ashcroft. 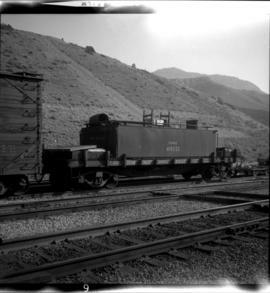 Photograph depicts CPR water service car #415222 at Ashcroft. The car was attached to a work crew train. 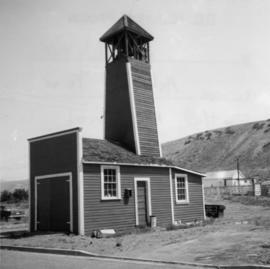 Photograph depicts a former fire hall that was now preserved. 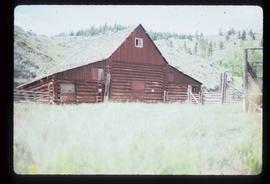 Image depicts a "box barn" on the historic Hat Creek Ranch site north of Ashcroft, B.C. 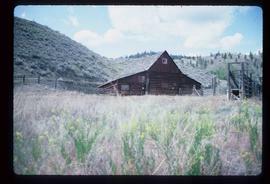 Image depicts an old barn on the historic Hat Creek Ranch site north of Ashcroft, B.C. 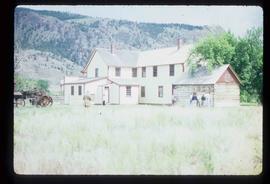 Image depicts numerous individuals standing near the Ranch house and McLean Cabin on the historic Hat Creek Ranch site north of Ashcroft, B.C. 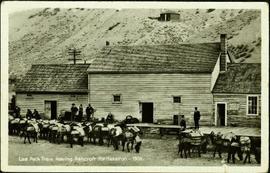 Image depicts several individuals sitting on the front porch of the Ranch house on the historic Hat Creek Ranch site north of Ashcroft, B.C. 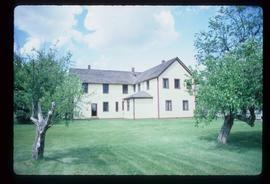 Image depicts the Ranch house on the historic Hat Creek Ranch site north of Ashcroft, B.C. 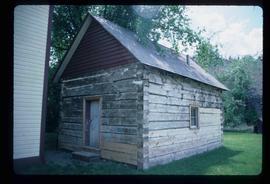 Image depicts the front of the ranch house on the historic Hat Creek Ranch site north of Ashcroft, B.C. 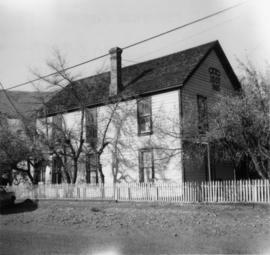 Image depicts the road leading to the historic Hat Creek Ranch site north of Ashcroft, B.C. 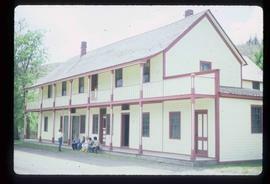 Several individuals are sitting on the front porch of the Ranch house. 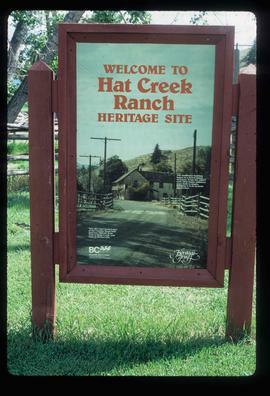 Image depicts the welcome sign of the historic Hat Creek Ranch site north of Ashcroft, B.C. 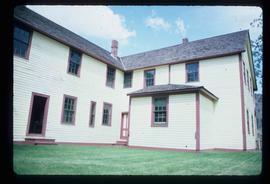 Photograph depicts an Independent Order of Foresters 1895 house. 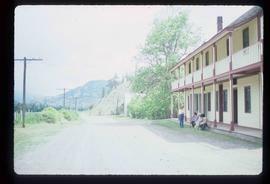 Jean Caux's Pack Train Leaving Ashcroft, B.C. 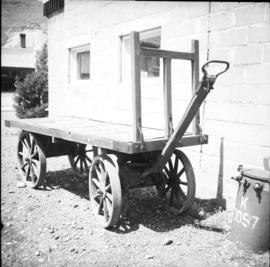 Photograph depicts a hand truck that was found outside a museum in Ashcroft.